Do you ever find that just towards the end of the week you are left with a handful of peas, a carrot, and odd piece of cauliflower etc etc? Or do you run out of ideas what to make for lunch on a Sunday besides khichdi? I do and that is the time the humble vegetable pilau comes to my rescue. Quick to make, and if you have a rice cooker then so much better as you just put the ingredients together within 15 minutes or so, switch on the rice cooker and go back to watching your favourite movie or reading a book. This recipe is a rough guideline but please use vegetables of your preference. Not much washing up to do and perhaps older kids can help in getting the vegetables ready. Wash the rice and soak it in 2 cups of water till you get the vegetables ready. Cut the garlic into thin slices. Cut the ginger into thin strips. Slit the green chillis into half or use paste. Prepare the vegetables you are going to use. When it is hot, add cinnamon, cardamom, cloves, red chilli, star anise and peppercorns. Stir fry for a few minutes. When they begin to splutter, add the asafoetida and sliced onions. Stir fry them till they become soft and light brown in colour. Add the ginger, green chillis, cashew nuts, raisins and garlic. Stir fry for a few seconds. Add turmeric, cinnamon and clove powder. Stir fry for a few seconds. Add the vegetables and mix well. Add the rice with the water and salt. Cover the pan and cook over low heat till the rice is done. This usually takes about 20 minutes. If you are using a rice cooker, add rice and water into the cooker bowl. Add the sauteed vegetables and salt. Mix well. Switch the cooker on. 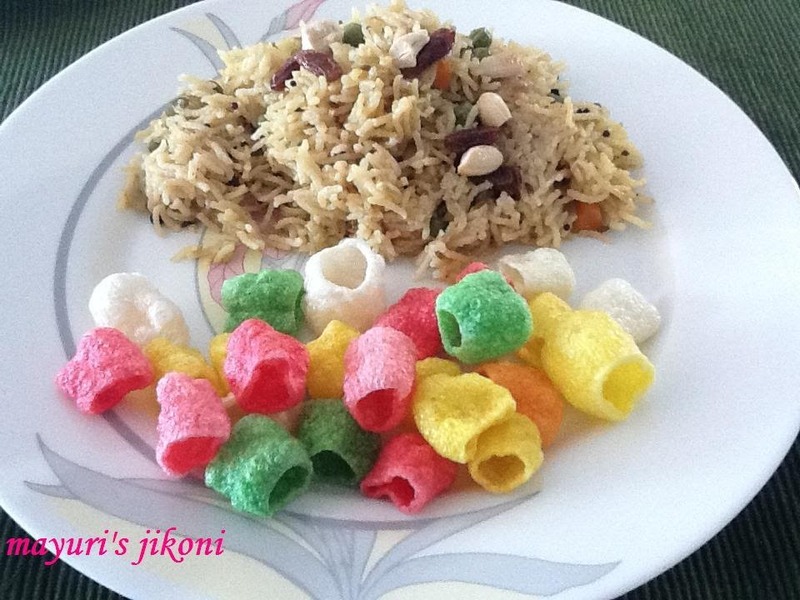 Serve hot pilau with yogurt, papad, papdi, pickles of your choice. You may need an extra ½ cup water as the amount required all depends on the rice. Check while the rice is cooking. If the water is over and the rice feels a bit raw add hot water. Instead of cinnamon and clove powder you can use garam masala or ready made pilau masala. Tastes good with coriander garlic chaas.